Traffic, detours and a few missed turns by the taxi driver – the delays added up to the fact that I was 5 minutes late for the check in for my flight home tonight. But this was not conveyed to me or my girlfriend, Terry – I was sent in circles around the airport, and ended up in a location where she could not follow me. We said our goodbye, cried for a moment and she left. A few minutes later I crossed paths with an American who was in the same situation, and I realized I had missed the fight. I tried and tried to contact Terry – but her phones were dead. After an hour and a half of trying to reschedule at the United Airlines office I finally got a fight scheduled for the morning. I tried to catch 4 different taxies, all four did not go as far as Ecatepec, in a moment of frustration, panic, anger and a little fear.. I said a silent prayer to Santa Muerte asking for help and protection. Less than 5 minutes later a black car pulls up, and the gentleman driving asked if I needed help, a bit dumbfounded and apprehensive, I answered, Yes, and took a good look into his eyes and trusted what I saw.. He was not a taxi driver nor an uber driver, just a person. I took the biggest leap of faith ever in my life – I trusted this man, this complete stranger, to get me home safely! A few minutes into our drive I tossed it out that I was a devotee of Santa Muerte, as it turns out, both he and his girlfriend also were devotees. They attend services at the Santa Muerte International Temple. His english was as broken as my Spanish, but we were able to communicate sufficiently. Finally returning to the Houston, Texas area I stopped for lunch – setting up an ad hoc altar in appreciation of existence. After lunch and devotions at my tiny altar my next step was to check my bank account – I wasn’t sure if I got paid during the flood! Three stops before the altar/tacos hour I had tried to check my account – at the first two stops there was no ATM – at the last stop I was told the ATM did not work by a very polite Mexican man. Finally I stopped at a Super K food store only to discover la Nina waiting for me! Long story, but the moral is……. 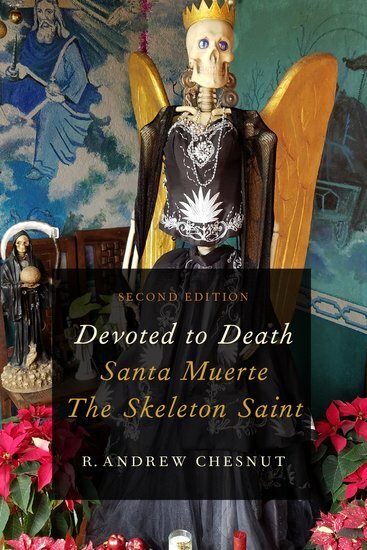 Santa Muerte is a truly powerful and efficacious saint! Any lingering doubts I had as to the veracity of this path were extinguished with the hand shake, hug and exchange of blessings between brothers of faith as that stranger in Mexico City delivered me home safely! I have zero doubt that the reason I was delayed was that I was to cross paths with his person. We exchanged contact information and I have complete certainty that we will see each other at the Temple when I return in December. In a moment of confused uncertainty, clarity is found in the great wisdom and love of our beloved Godmother. When the hand of the powerful Comandante is upon the heart of the humble, Enriqueta Vargas gives clear understanding and reassurance. I still have so much more to this than is written there. I will have a better full dissertation of my experience soon I hope. It has been like a graduation from one level of understanding to a newer, clearer level. From an American perspective this is grounds for a straight jacket. From my perspective, this, in conjunction with a dream that I had last night of mi Abuelo Y mi Padrino, Senor Pantera. This has been the ultimate manifestation of humble faith!